In early December OffBeat solicited nominations from musicians and others in the music community. We gave these results to our writers and editors and, with input from both, determined the nominations in each category. Public voting on the resulting ballot began on December 17 with voting ending on Tuesday, January 5. 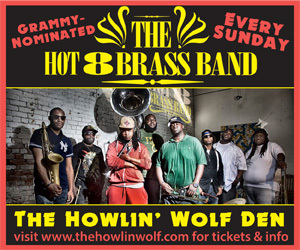 Winners will be announced at the Best of the Beat, which returns to Generations Hall on Thursday, January 21. OffBeat will recognize our Lifetime Achievement honorees: The Radiators (Music); Germaine Bazzle (Music Education); Roland and Mary Von Kurnatowski (Music Business); and Catherine Lasperches, nurse practitioner at the New Orleans Musicians Clinic and LSU Health Network, will receive our Heartbeat Award. Publisher Jan Ramsey will host the awards on January 21 with an assist from WWL-TV’s Eric Paulsen at the Music Business Awards on January 13 at the Orpheum Theater. Many of the city’s finest restaurants will be serving complimentary cuisine, including Barcadia, Bratz Y’all, Bittersweet Confections, Gumbo Shop, Custom Catering, Dat Dog, Fulton Alley, Creole Cuisine Concepts, Praline Connection, Nola Foods & Whoodoo BBQ, The Norwegian Seaman’s Church, Whole Foods, Susan Spicer’s Mondo, Tee-Eva’s and many more. 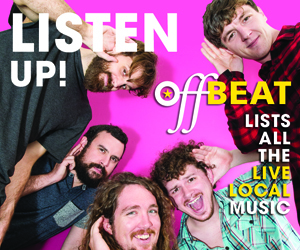 Discounted advance tickets for the Best of the Beat are on sale now at OffBeat.com; tickets purchased day-of are $45. We hope to see you at the Best of the Beat: two stages, plenty of food, mingling with your favorite musicians—all for the cost of a good lunch.